This cycle was the last work that Schumann composed in Dresden before his move to Düsseldorf. It has a strange history in that Schumann believed (mistakenly) that Lenau had died and added to the five settings of that poet a concluding ‘Requiem’ with an ‘old Catholic poem’. This gesture of mourning turned out to be prophetic: on the very day of the first performance in a gathering at the home of Schumann’s friend Bendemann (25 August 1850) news came that Lenau had in fact died. This turned out to be a mournful day in the Schumanns lives as their farewell to Dresden was darkened by a strangely disturbing coincidence. Schumann felt ‘as if I were tolling a passing-bell all unawares’. Clara Schumann noted in her diary: ‘The event, together with the songs put us all in melancholic mood …’ Because of Lenau's death Schumann was especially anxious to publish the songs as soon as possible. He wrote to the publisher Kistner: ‘One might decorate the title page with emblems of mourning such a black drape through which a star is visible … I should be pleased if you would help me to create a modest monument to the great but unfortunate poet. Knowing you, I am certain that you will find the appropriate design.’ In the event, Kistner complied with the composer’s wishes. Sams makes the point that Schumann might have especially identified with Lenau’s fate as a fellow-syphilitic. and come back again one day. and be sure to come back again one day. These lines are taken from Lenau’s version of Faust which was very influenced by Goethe (despite a different story line—the eponymous anti-hero stabs himself) and dates from 1836. Each section of the long poem is titled, and this lyric come from ‘The Smithy’, a conversation between Faust and the smith (here called ‘Meister’) who dispenses homespun philosophy in the manner of Shakespeare’s working-class folk, as Faust’s horse is shod. Despite its simplicity this is one of Schumann’s inspired single-paged songs. The piano hammers away in accented chords (on the beat in the right hand, off the beat in the left) and the singer is given a memorable little tune which betokens the pleasure and innocence of good honest labour. The song is a worthy successor to the numerous Schubert songs of the same type (Fischerlied, Pflügerlied etc.) and as an evocation of life at the forge it is almost as successful as the celebrated Brahms song Der Schmied which is a portrait of a much younger man with quicker hammer strokes. The composer directs that the last verse should be sung piano as if we can see the horse disappearing into the distance with its bright new shoes. not then revive like the rose. Schumann’s Haushaltbuch tells us that he composed no less than three Lenau songs in one day (this cursory information for 2 August is followed by the single word ‘Glück’—‘happiness’) and it is probable that this song was one of that number. It is perhaps the most celebrated of the Lenau settings, and the one most often heard singly in recital. In some ways the song is a gift to the pianist especially, with its beautiful bel canto melody poised above the aristocratic languor of gently flowing triplets in the left hand. This suggests Chopin of course (we know that Schumann was shocked by this composer’s death in the previous year and tried in vain to honour him in Dresden), but also Chopin’s model Bellini in the strangely florid (and difficult) ornamentation of the vocal line both at ‘heissen Strahl der Sonnen’ and (less appropriately) at ‘möchte dir zu Füssen’ in the second verse. The prevailing mood is one of ‘calme, luxe et volupté’, although at ‘Könnt ich dann auch nicht sehen dich freudig auferstehen’ there is a hint of recitative and agitation; a quickening of pace is in any case desirable to make sense of the strange prosody where the words are punctuated by rests in a senseless manner (between ‘auch’ and ‘nicht’ and again between ‘sehen’ and ‘dich’—another example of the composer slavishly following the stanza as printed and not enjambing lines which any student would see needed to be connected). This is not the only violence done to a lyric by a poet whom the composer claimed to have admired. Words are added to the last line of each strophe (‘dunklem’ and ‘freudig’) to help the melody (yet ruin the metre) and the repeat of the first verse (admittedly a moving recapitulation from the musical point of view) destroys the point of Lenau’s poem which focuses on his loved one at the end rather than the opening image of the rose. Poor Lenau has also suffered from other composers chopping his poems about at will—Liszt’s Die drei Zigeuner is perhaps the most famous example. The postlude is very obscure. There are two bars of tied chords—syncopations which end up by sounding on, rather than off, the beat in performance—one would need to be following the score to hear something of the effect the composer wanted. Nevertheless this ‘velvet music of sated love and roses’ (Sams) remains a firm favourite with singers and audiences. It spins the kind of magic spell which gives us more than a glimpse of the inspired Eusebius of 1840. Süss wie des Frühlings erstes Lied. seemed as dear as the first green in the woods. as sweetly as spring’s first song in the trees. the last dream of my youth was taking leave of me. Once again Schumann changes Lenau, and inexplicably. Why did he write ‘süss wie des Frühlings erstes Lied’ and leave out the crucial following words ‘im Hain’ which would have rhymed with ‘Herzen ein’ of the preceding line? This is clearly not the astute, literary Schumann of old. And yet somehow the ability to weave magic remains as if of all the powers to desert him the most basic to his genius have somehow remained intact—his feeling and his empathy. Indeed, in some of these late songs it seems that these qualities are all that interest him. The song is in six flats and is thus already outside the borders of musical normality. The music is as etiolated as memory itself—the binding thread is a haunting little phrase of five quavers followed by a sighing cadence. This stands for remembered words—we hear the woman’s voice clearly in the piano after ‘Und was sie sprach’. In the third verse this is transferred into the bass clef. The beautiful harmonic progression at ‘Jugendtraum mir schwand’ (a falling bass line followed by a left-hand staccato) is reminiscent of other Schumannian interrupted dreams—notably two songs in Dichterliebe: the end of Ich hab’ im Traum geweinet and at the phrase ‘zerfliesst’s wie eitel Schaum’ at the end of Aus alten Märchen. In the postlude we hear these fragments of speech once again as the left hand answers the right in gentle conversation, a veritable colloque sentimental. The whole is full of the most understated sadness as if the singer were a person of the most exquisite tact. By the end of the song the chord of G flat major has enharmonically changed to that of F sharp. This is the dominant chord of the next song which is in B major—an indication that Schumann truly planned the Lenau songs as a linked set. The keys of the cycle’s seven songs are E flat major – B flat major – E flat minor – B major – E flat minor (ending in E flat major) – E flat minor – E flat major. The piano part has increasing leaps. The interlude after ‘er schien mir die Gestalt’ is a sixth and becomes an octave after ‘zum Herzen ein’. This is a version of a motif which Sams associates with longing and yearning—‘a mimetic image of arms outstretched whether in offered embrace or supplication’. Freudig fort und fort erzählen! Oder dich der Tod entzogen. Und auf deine Lieder sinnen. wakes at your clear voice. that now respeak it each to each. remembering you and your songs. This setting of an early Lenau poem from his Reiseblätter is related to Des Sennen Abschied (Op 79 No 23) which Schumann had written as part of his Liederalbum für die Jugend. It has the same remarkable feel for rustic simplicity, outdoor music of the valleys with the suggestion of peasant music, droning pipes and the blare of booming alphorn. The awkwardness of good-hearted yokels is inherent in the dissonance of the sometimes jarring basses; the assonance of yodels is charmingly apparent in the leaping sixths in the accompaniment which are a binding motif throughout. Despite this deliberate mood of simplicity where we expect a cuckoo-clock to sing a duet with the voice at any moment, this song is somehow superbly aristocratic, a character-piece perhaps, but one with a heart. The accented bass notes (especially the low and loud F sharp underneath ‘Horch, o Sennin, wie dein Sang’) are highly unusual and effective piano writing. If one has ever heard the low sounds of an alphorn, music to intrigue cows and sometimes indistinguishable from their own speech, this combination of different music in each of the accompanist’s hands at this point seems to be a metaphor for a combination of vocal and instrumental music resounding through the valleys. Eric Sams hears the low notes as indicative of the rooted strength of mountains. Once again the prosody is not of the happiest (the elongation of the first ‘einmal’ for example) but the poem is spared the truncation of some of the other settings. 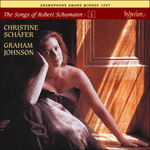 Schumann’s sympathy is engaged with the female character as if she were a Tyrolean Mignon; mention of the inevitability of her death and the consequent silence of her landscape (as if Shakespeare had written ‘golden lads and cowgirls must / As chimney sweepers come to dust’) prompts the silencing of the mountain music itself. A most tender passage at ‘traurig stumm herübersehn’—a pedal point on droning D sharp major chords—becalms the yodel and turns it into an elegiac berceuse. Happily there is no attempt here to revert to the mood of the opening and the song ends in the dominant in a remarkable diminuendo, like an echo taking a long time to disappear in a mountainous chasm. Stille hier der Geist der Liebe. for answer only the silence of the woods. The low D sharp that has been the last note of Die Sennin is now transformed enharmonically into the tonic of E flat minor. This lasts for only two lines before a change into six sharps for three lines and after that three flats, but it seems important for Schumann to have begun the song in E flat minor nevertheless. The little finger of the right hand sings a long melody in semibreves while a figuration of winding quavers, flowing sinuously from right hand to left, weaves the most sensuous of murmuring accompaniments. Of course those rustling quavers are water music, brought into being by the words ‘leise klagt die Quelle fort’, but the similarities between the feel of this figuration under the pianist’s fingers and Chopin’s Etude in E flat minor Op 10 No 6 is too strong to be merely coincidental; this must be one of Schumann’s homages to Chopin. Commemorative music seems to be on the composer’s mind as his period at Dresden drew to an end. The whole song has an elegiac tone where a bleak landscape seems an analogy for a world without one of its heroes. The music achieves a kind of majesty, not to mention religiosity, which shows that it is contemporary with the Requiem for Lenau from the same opus and composed the very next day. The heart is addressed in the third line of the verse and the key signature changes as if we were entering deeper into the music and a more intimate part of the body of the song was being unlocked to our ears; the effect is of layers being peeled away. The setting of ‘Geist der Liebe’, poised on a high note is truly magical—for a single bar quavers cede to triplets in the accompaniment as if only love were capable of quickening the dead. As if to confirm this we hear these triplets again eight bars later on ‘Herz’. Schumann has not forgotten how to construct a remarkable bass line in counterpoint to the vocal melody. Indeed this is the most remarkable musical feature of this song and it is this which gives the music its dark power. ‘Deine tiefe, hoffnungslose’ is heart-breaking. All in all, this is one of the most underestimated of Schumann’s songs. Instead of the long stretches of semiquaver arpeggios in songs like Ihre Stimme and Requiem, which can easily sound automatic, here is a new accompanimental texture which broods rather than purls. Sams points out that the whole song is constructed around a motif where rising semitones in descending sequence have the meaning of distress. to wish us both dead. Here, more than anywhere else in this cycle, Schumann seems to be quoting himself. This is a close relation of Ich hab’ im Traum geweinet from Dichterliebe—so close, in fact, that it is in the same key, and the dotted rhythm motif which dryly punctuates that song is very present here, admittedly legato but in exactly the same octave in the piano. The connecting word between the two songs seems to be ‘nightmare’, as if Schumann’s reading of Lenau’s poem takes it to be the recounting of a terrible dream. The rhythm of the vocal line must have seemed avant-garde to the first singers. A sequence of crotchet duplets straddle each 3/4 bar dragging ominously against the pulse—the brackets uniting them somehow look like a canopy of black clouds which obscures the light. The change from duplets back into quavers at ‘so bang und schwer’ has the effect of quickening the vocal line so as to suggest paranoia and panic. Schumann excels himself in obfuscation by writing staccatissimo minims, the first before ‘wir beide traurig’. This is truly music of a strange imagination, it seems to matter less and less to the composer how it is to be realised in practical terms—it is enough that he can imagine it. Described in this way, Schumann seems to have much in common with the Beethoven of the third period. The second strophe begins a bar later than the first, perhaps an illustration of ‘so heiss, so stumm, so trübe’ as if the night itself could barely be coaxed into vocal utterance. The music is all shudder and gesture and mystery. As in Ich hab’ im Traum geweinet Sams detects a use of a motif (the chord progression I–IV–I) which he associates with nobility in general and in the case of this song with the regality of self-sacrifice and renunciation. 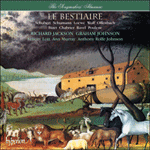 The postlude is another example of music written to be read rather than heard. In performance it is all but impossible for the pianist to play these portentous chords in such a way that we can hear that they are off the beat. Nevertheless no one can deny that a strange poem has been set in a strange and highly neurotic way. Heilger Geist, lass Trost nicht fehlen. his Lord in the glory of Heaven. let not your comfort fail him, holy spirit. the beautiful harp of the angels. Alongside Meine Rose the popularity of this song has overshadowed the other Lenau settings. It has a stirring climax and it burns with a message. I fell in love with it on an HMV plum-label ‘78’ recording by the mezzo soprano Flora Nielsen accompanied by Gerald Moore, both of whom were mentors in my student years. Despite a certain mawkishness in the text (not on a level with the Lenau poetry that has preceded it in the opus) the song was composed with such a full heart that it convinces by its sincerity—assuming it is well sung, for this is a real test of singing ability and breath control and Schumann in his last period is not particularly considerate with singers. Right at the end of the poem angels harps are mentioned, and it is this which encourages the composer to re-string his lyre and sweep the piano strings with harp evocation once again (Schumann was a dab hand at harp-inspired music at the time: the Harper’s songs from Wilhelm Meister lay behind him, and the Op 139 harp songs were yet to be composed). After this is said, of course, this is piano music par excellence, impossible to envisage without a pedal and the singing tone of the piano. Some of the Chopinesque traits of Einsamkeit (composed the day before) are to be heard here, such as the tune in long note-values in the little finger of the right hand; even the snaking figuration that governed that song—a descending pattern of ascending seconds—is introduced on the phrase ‘seligem Verein’ in the first verse as if all great composers (perhaps Schumann’s elite group of artists, his ‘Davidsbund’, is also a ‘Musik-Verein’?) will meet again one day in heaven. Perhaps there is also a community of great lovers in Schumann’s mind, and the composer believes that he and Clara were of their number. The poem (which begins in its original Latin: ‘Requiescat a labore / doloroso at amore! / unionem coelitum / flagitavit / jam intravit / salvatoris adytum’) is Héloïse’s lament for the death of Peter Abelard (1079–1142) many years after the scandal of their illegitimate child, secret marriage, and Abelard’s castration at the order of her uncle. (As early as 1831 Schumann had struggled to read the philosophy of Abelard and found it difficult but illuminating—the background to this poem clearly meant something to him.) Héloïse writes these words as an abbess; she remembers her love for Peter as a thing of the past. He had once been a great lover but ended his life as an old monk, an original thinker who had been stripped of his manhood and was now exhausted by the hostility of the church. The golden legend of ‘Abelard and Héloïse’ is here a glorious memory, but only a memory nevertheless; could it be that the composer, exhausted by the hostility of Dresden and fearful for his future, mourned the fact that the great days of ‘Robert and Clara’ were also long since over? The text of this poem, as Schumann read it, calls for a chorus of monks—which may explain why the composer seems to have had a scena in mind, a grand lament with suggestions of something staged, with orchestra and chorus. The music seems composed in layers. The vocal line is a counter-melody to a harp or piano piece—to be heard off-stage perhaps, or floating from the gallery of a cathedral, rather than a tune which was born with the accompaniment as a single thought. It is this which both de-personalises the music and gives it a certain public grandeur. This applies most of all to the music of the third verse which becomes really imposing with the rhetorical question ‘hörst du? Jubelsang erklingt’. At ‘Feiertöne’ semiquavers are replaced by quintuplets and the music works up into a fine frenzy. Unfortunately Schumann gives the performers very little time to come down from their high for the recapitulation (Schubert made a similar mistake at the end of Gretchen am Spinnrade—his only miscalculation in that great work). 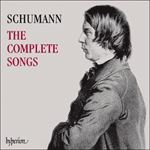 Adopting the same tactic as in Meine Rose, Schumann repeats the first verse and thus vitiates the fervour of the poem which started on a personal note and moved triumphantly to the universal. Nevertheless we are reminded by this return to ‘Ruh von schmerzenreichen Mühen aus’ that Requiem is a Lied, as opposed to an aria; there is a return of the personal and cherishing note. The elongation (five beats) of ‘trug Verlangen’ suggests the infinite patience of a long-suffering soul to rejoin his Maker. An ascent into heaven is depicted by the rising scale of ‘ist gegangen zu des Heilands Wohnung ein’. The final note of the vocal line, no less than ten beats long, is one of the composer’s most inspired perorations; as the singer holds that note (if she can) it seems to merge with the piano and imperceptibly dematerialise—surely a metaphor for the soul slipping out of the body and becoming at one with the angelic harpists and heavenly choir.